Good evening everybody. I'm Alex Trisoglio, and I'd like to welcome you to Week 6 of "Introduction to the Middle Way". As usual, let's start with a brief review of what we did last week. The idea of self is baseless: As you may recall, last week was all about establishing that the self of the person does not truly exist, and we did this by examining the idea of the 'self', which is what we cling to, and showing that it is baseless. And we saw that because the idea of the self is baseless, not only does it mean there is no 'truly existing self of the person', but it means we can choose a different idea of the self. We can reinvent ourselves: as a Buddhist, as a bodhisattva on the path, as a deity if we're doing sadhana practice; and this is not easy, but it's doable. Conventional truth collapses upon analysis: The second thing we talked about was: conventional truth collapses upon analysis. As we said, if we analyze the conventional truth, all elaborations cease. All thought, all language collapses. And so, partly as a result of that, Chandrakirti does not seek to analyze the conventional. He just follows the consensus of everyday people. Horse practice and donkey practice: Another thing we came across is Padampa Sangye's teaching about the horse practice and the donkey practice. And here, Rinpoche said, you start with a very emotional, devotional kind of practice, praying to the Buddha, thinking he's in front of you, visualizing him clearly, with a subject and an object, tears in your eyes - all of that. And then, suddenly, you remember that Buddha is emptiness. Buddha is not separate from your mind. There is no truly existing Buddha. And then, you don't know what to do - because your devotion disappears, the tears stop, the yearning and the longing stops - and Padampa Sangye said when that happens, it's like riding a horse. But almost at once we think, "I want to get back to my old model of practice that's filled with emotion and devotion". And then, of course, we seek to bring back the Buddha, all the emotion and crying and the rest, and Padampa Sangye says that is like dismounting the horse and riding the donkey. That's going to be important to us this week, because we're going to focus on the 'emptiness of emptiness'. Nonduality. And we're also going to start asking, "what does that mean, for our practice?". 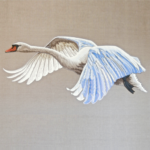 We'll start by completing Chapter 6, verses 179-226, concluding with a lovely verse about how the king of swans will spread his broad wings that are the two truths - wisdom and skillful means - to lead the other swans to liberation. So that's where we're going to end up. Then we'll turn to the Heart Sutra, where I'll go through some of the teachings Rinpoche gave on "Prajñaparamita" in Kathmandu earlier this year, in April-May. And along the way we'll pause for a little practice, because, as we've been saying many times, we can't understand nonduality except through our meditation. So this week, I am not going to try to rely on words alone! Whip, rope, person, and bull - all merge in No-Thing. This heaven is so vast no message can stain it. How may a snowflake exist in a raging fire? Here are the footprints of the patriarchs. ● Act I, Scene 1 ("The Setup"): In Week 1, we begin in the ordinary world, where we start to ask questions about our life. Perhaps we realize that all our hopes and plans, our work and relationships, aren't bringing us the happiness and freedom that we anticipated. Maybe we feel there has to be more to life than this. Then there is some kind of catalyst. We hear about the possibility of enlightenment, we come across the Buddha's teachings, and we learn that they are founded on a realization of emptiness and nonduality. We hear that there is something called the Middle Way. We hear the Theme of the story and it touches us emotionally. It resonates with us. We don't really understand it, but we are intrigued. We want to learn more about the Middle Way. ● Act I, Scene 2 ("The Debate"): In Week 2, as we think about embarking on the journey to explore the Middle Way, we experience internal resistance. We start to find the reasons that even though it might seem like a good idea, it's not practical or feasible for us. We don’t have the time. We're too busy with work and family commitments. The view sounds very academic and complicated, and we can't really see how it's relevant to our lives. We have all kinds of fears and excuses and reasons not to proceed. But eventually we gather our resolve, convince ourselves that this journey is important, and overcome our fears and resistance. We decide to set out on the journey, which brings us into Act II. ● Act II, Scene 1 ("The Road of Trials" and the B Story): In Week 3, the adventure begins. We start to meet the ‘bad guys’ that believe in truly existing phenomena: the Hindu Samkhya that believe in truly-existing self-arising, and the early Buddhist Vaibhashika and Sautrantika schools that believe in truly existing other-arising. The plotline also introduces the "B Story" (the "love story"). We started out on this journey in order to refute truly existing ideas of self, since we know that self-clinging is the reason we're trapped in samsara. But now we see the B Story as well: we realize that if we want to function in the world, we can't ignore the conventions of ordinary people. Both of the Two Truths are important. And as bodhisattvas, we want happiness and liberation for all sentient beings; we don't want to get caught in nihilistic refutations. Now we also have the B Story of our love and compassion for sentient beings. ● Act II, Scene 2 ("The Promise of the Premise"): By Week 4, we are becoming seasoned adventurers rather than the naïve beginners we were before we set out on our journey. This is the part of the story where the main character explores the new world and the audience is entertained by the premise they have been promised ('Watch Chandrakirti wield his mighty logic! See the Madhyamaka heroes vanquish all enemies!') In particular, we encounter - and defeat - our most challenging opponents, the Cittamatra. Now we're refuting wrong views not just because they lead to untenable claims of truly existing phenomena in the ultimate truth, but also because they lead to nihilism in conventional truth by denying the experience and understanding of ordinary people in the world. We complete our refutation of the truly existing self of phenomena. ● Act II, Scene 3 ("Midpoint"): In Week 5, we reach the highpoint of the action: we encounter our opponents again, this time in the context of their belief in a truly existing self. Again, we rout them. Everything is great. We have got everything we think we want. We have refuted anything that our opponent might use to construct an imputed idea of a truly or substantially existing self - and this includes contemporary philosophers of mind that hold dualistic views. We have completely refuted and deconstructed all views. But not everything we think we want is what we actually need in the end. ● Act II, Scene 4 ("Dark Night of the Soul / Apotheosis"): In Week 6, we enter the last scene in Act II. As many of you are experiencing, doubt and our emotional foes regroup. The situation that we thought was "great" in Week 5 disintegrates, as we realize that our deconstruction of all stories risks turning on itself, and dragging us down into nihilism and hopelessness: if everything is emptiness, how can life have any meaning or purpose? Why does practicing the Dharma make any difference? Is any of this worth it? We feel like we have lost everything that we gained. The initial goal now looks even more impossible than before. We enter the Dark Night of the Soul. We are lost and without direction. As Joseph Campbell puts it, the Hero only comes out of this Dark Night of the Soul when "he or she moves beyond the pairs of opposites to a state of divine knowledge, love, compassion and bliss." This is apotheosis: the culmination or climax, the transcendence of ordinary duality. In our case, we realize that our path is not just deconstructing the truly existing self and showing that "form is emptiness", but in establishing the nondual understanding of the emptiness of emptiness. We realize that wisdom comes together with compassion and skilful means. We understand the paradoxical truth of the Heart Sutra: "form is emptiness; emptiness also is form", and emerge with the realization of Prajñaparamita. We have secured what Campbell calls the "ultimate boon" (that which has the greatest benefit). We have achieved the goal of our quest. In Week 7, we will enter Act III "The Return", where we shall attempt to return with the ultimate boon to the ordinary world. In our case, we will explore how we can bring the view of emptiness and nonduality into our practice, and then finally into our everyday life. 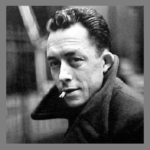 “There is only one really serious philosophical problem,” Camus says, “and that is suicide. Deciding whether or not life is worth living is to answer the fundamental question in philosophy. All other questions follow from that” (The Myth of Sisyphus, 3). Camus sees this question of suicide as a natural response to an underlying premise, namely that life is absurd in a variety of ways. … it is absurd to continually seek meaning in life when there is none, and it is absurd to hope for some form of continued existence after death given that the latter results in our extinction. But Camus also thinks it absurd to try to know, understand, or explain the world, for he sees the attempt to gain rational knowledge as futile. Here Camus pits himself against science and philosophy, dismissing the claims of all forms of rational analysis: “That universal reason, practical or ethical, that determinism, those categories that explain everything are enough to make a decent man laugh” (The Myth of Sisyphus, 21). From Chandrakirti's perspective, you could perhaps say that Camus has completed the task of deconstruction. He has established that form is emptiness. He has shown there is no truly existing, eternalistic 'meaning'. But now he is truly lost. And far from being unusual, this kind of fight with our demons is an essential part of the Hero's Journey, as we have seen. It corresponds to our fight with those last remnants of our old 'self' - this baseless story of 'self' that we used to tell ourselves, and that doesn't want to be rewritten. Our demons are our habits. 9. Atonement with the Father: In this step the Hero must confront and be initiated by whatever holds the ultimate power in his or her life. In many myths and stories this is the father, or a father figure who has life and death power. This is the centre point of the journey. All the previous steps have been moving into this place, all that follow will move out from it. Although this step is most frequently symbolized by an encounter with a male entity, it does not have to be a male; just someone or thing with incredible power. 10. Apotheosis: When someone dies a physical death, or dies to the self to live in spirit, he or she moves beyond the pairs of opposites to a state of divine knowledge, love, compassion and bliss. 11. The Ultimate Boon: The ultimate boon is the achievement of the goal of the quest. It is what the person went on the journey to get. All the previous steps serve to prepare and purify the person for this step, since in many myths the boon is something transcendent like the elixir of life itself, or a plant that supplies immortality, or the holy grail. Campbell's version fits the Madhyamaka story well. In our case, the 'father figure' with life or death power is the ego. The apotheosis in which we "die to the self, to live in spirit" and "move beyond the pairs of opposites" describes nonduality very well. And the ultimate boon, the goal of our question, is enlightenment. 10. Bad Guys Close In: Doubt, jealousy, fear, foes both physical and emotional regroup to defeat the Hero’s goal, and the Hero’s “great” situation disintegrates. 11. All is Lost: This is the opposite moment from the "great" situation of the Midpoint: the moment that the Hero realizes they’ve lost everything they gained, or everything they now have has no meaning. The initial goal now looks even more impossible than before. 12. Dark Night of the Soul: The Hero hits bottom, and wallows in hopelessness. 13. Break Into Three (Choosing Act III): Thanks to a fresh idea, new inspiration, or last-minute Thematic advice from the B Story (usually the love interest), the main character chooses to try again. This fits our emotional journey along the Madhyamaka very well. As we noted previously, we have spent many weeks refuting all these different views, and come to a place of emptiness where there are no views. But now it seems we are left with no stories or purpose at all, and so we enter the Dark Night of the Soul. We hit bottom. We have to confront our demons. As Joseph Campbell noted, this is very similar to the Buddha's own life story. In the Buddha's case, he has to confront Mara and his daughters before enlightenment. Mara is a demon - the Lord of Death - and his name means 'destruction'. He represents our ego, our emotions, our ignorance. So Siddhartha is sitting beneath the bodhi tree, about to attain his enlightenment, and Mara brings his most beautiful daughters to seduce him: Tanha (craving), Arati (aversion and discontentment) and Raga (attachment and desire). But Siddhartha remains unmoved in his meditation. So then Mara brings vast armies of monsters to attack him, and yet still, Siddhartha sits peacefully, unmoving. Then Mara claims that the seat of enlightenment rightfully belongs to him, and not to the mortal Siddhartha. And all of Mara's demon soldiers cry out, "I am his witness!". Mara turns to Siddhartha and says, "who will speak for you?". And in a very famous moment, Siddhartha reaches his right hand to touch the earth, and the earth itself speaks: "I bear you witness". Mara disappears. And as the morning star rises in the sky, Siddhartha realizes enlightenment and becomes a Buddha. So maybe we can see our own hopelessness, our own depression and nihilism as a manifestation of Mara. The Madhyamakavatara is a 'View' teaching, so Chandrakirti doesn't give us much practice advice. We'll have to talk about that separately. But one thing we will see today in the commentary is the importance of compassion. Whatever may be happening with our emotions, even if we're feeling a sense of hopelessness, we must never give up our compassion. We'll also understand a little more about why Chandrakirti praised compassion in his homage at the beginning of the Madhyamakavatara, and why it is so important for us in this chapter. We'll also return to the importance of practice. As Rinpoche often says, if we're feeling a loss of inspiration or a sense of hopelessness, that's another reason why it's so important to generate merit. In verse 6:4 at the beginning of this chapter, Chandrakirti explained to whom should the Madhyamika be taught. And we learned that if we're the kind of students who have tears in our eyes and the hairs on our body quiver when we hear these teachings on emptiness, then yes, we should be given the full teachings on the emptiness of the person and the emptiness of phenomena. But if it isn't yet our natural inclination to respond that way, then we need to accumulate more merit. And as we've been saying throughout these teachings, that can only be done through practice. Practice really is 98% of the Madhyamaka path. 6:179-6:223: first we'll explain emptiness as it is to be realized by the Mahayana, and that corresponds to the logic tree #12 in the structural outline (page 442). 6:224-6:226: the last three verses of Chapter 6 are a summary of the qualities attained. Remember, we're accomplishing the paramita of wisdom here, so that's what we attain at the end of the sixth bhumi, once we have completed and perfected that prajña-paramita. Turning to the text, verse 179 begins by reminding us that Buddha taught emptiness in two ways: through the 'selflessness of the person', and the 'selflessness of phenomena'. It's actually a very straightforward verse. Most of the verses today are pretty straightforward, simply a list of the different kinds of emptiness that are realized in the Mahayana. The two divisions of individual and phenomenal selflessness were taught. In various ways for various trainees. Rinpoche didn't give much commentary when he taught these verses, so I'll be dipping a little into Mipham's commentary today (from the Padmakara translation of the Madhyamakavatara). And even in Mipham Rinpoche's commentary on verses 179-226, there are only really two significant sections, but they're both quite important. The first is a commentary on this verse, and Mipham asks: do the shravakas realize the non-self of phenomena? We discussed this question in Week 2 when we talked about the baby prince and the ministers (Chapter 1, verse 8). And as we said then, to attain samsara we have to remove our emotional defilements, which means we need to realize the selflessness of the person. Otherwise, you can't get rid of the notion of an innate "I", which is what we cling to. And since ultimately the selflessness of the person and the selflessness of phenomena are no different, you can also say that the shravakas and pratyekabuddhas must realize the selflessness of phenomena. As Mipham says, "it is rather as if when somebody drinks a mouthful of seawater, one cannot deny that he is drinking the sea". So the question is, if they realize the emptiness of the person, why don't they also realize the emptiness of phenomena? There are three reasons. Firstly, their interest. The shravakas' only interest is in getting out of samsara. They're not necessarily aspiring to liberate all sentient beings. The other two reasons are about the presence of internal and external conditions. The internal condition is, have they cultivated enough compassion and aspiration? And the external condition is, have they met a teacher of the Mahayana? Also, the nonexistence of the personal self is what Mipham calls a 'non-affirming negative': it is differing from the Mahayana view of the emptiness of everything, including the emptiness of emptiness. The emptiness of everything is beyond the 62 misconceptions or wrong views (Sanskrit: drishtigata, दृष्टिगत. The ➜62 wrong views can be found in the ➜Brahmajala Sutta), one of which is clinging to this 'non-affirming negative' or mégak (Wylie: med dgag, Tibetan: མེད་དགག་). Now of course the Prasangika also talk about the nonexistence of the personal self, but they don't cling to it, so this fault does not apply to them. But if one is on the Shravakayana path, there is a real danger that one could become attached to nirvana as a consequence of this clinging. They fail to establish liberation. In order to attain buddhahood, we need to completely realize both ultimate and conventional truths. In other words, we need to realize the nondual view, or what the Pundarika Sutra (Lotus Sutra) terms "the state of equality of all phenomena." And yet we also know that even though followers of different paths may all study Madhyamaka, some become bodhisattvas or buddhas, while others become shravakas or pratyekabuddhas. This means that merely studying and practicing the Prajñaparamita cannot be the cause of Buddhahood. So what's the difference? We have seen previously that the fourth of the Four Seals that set out the Mahayana Buddhist view of reality is that "nirvana is peace". 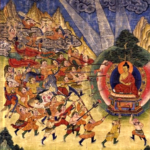 In the Shravakayana this "peace" refers to the peace of cessation, but Rinpoche explains that in the Mahayana it is understood to mean "beyond extremes", which is another way of saying "the state of equality of all phenomena". So Prajñaparamita is the realization of the evenness - the equality - of samsara and nirvana, and it transcends the extremes of either existence (samsara) or peace (nirvana, or 'cessation'). And if you don't have this equality - if like the shravakas, you have a preference for nirvana - then that means you have a view, and when analyzed it is shown to be an extreme view that is based on a 'truly existing' belief. And remember that Chandrakirti has no views. He certainly doesn't hold the view that nirvana is preferable to samsara. But if the shravakas can study the Prajñaparamita and end up with a different conclusion from the followers of the Madhyamaka, what accounts for the difference in their realization? Based on this reasoning, Mipham concludes that since the Prajñaparamita teachings themselves cannot account for the difference, the true cause of Buddhahood - in other words what distinguishes the Shravakayana and Mahayana - is the far greater emphasis on compassion and accumulation of merit in the Mahayana. And this is why bodhicitta is stressed so heavily in the Mahayana. As Rinpoche says, you might be an incredible scholar and know every detail of the Madhyamaka teachings. But unless you have cultivated bodhicitta, all your learning is going to get you nowhere when it comes to progress on the bodhisattva path. Mipham continues, saying that if you think you have supposedly realized nonduality, but you're still drawn only to the extreme of nirvana, it means you don't actually realize the equality of all things. In that case, even if you realized the luminosity of the uncontrived nature of mind, you could still fall into the extreme position of the shravakas. So that's why the Mahayana emphasizes the dharmadhatu, the Great Equality which does not reject samsara, and nor does it abide in the peace of nirvana, because it's fully endowed with enlightened activities. And that's also why our focus in Week 6 will be nonduality, the emptiness of emptiness, and the union of the two truths. It's very good for us to contemplate on this, just as practice advice for ourselves. Has our practice become overly focused on some kind of inner accomplishment? Or are we actually practicing bodhicitta as well? Are we manifesting as bodhisattvas? What is to be realized in Mahayana is these sixteen kinds of emptiness. There's the long list here, which we're going to go through in the following verses. And they're later divided or regrouped into four in verses 219-222. Are also taught to be the Mahayana. These sixteen and four kinds of emptiness describe all those aspects of emptiness which the shravakas and pratyekabuddhas do not realize because they may not have the interest, the merit, or the teacher. Body and mind too are explained as such. 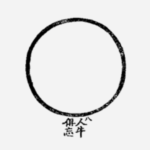 This is regarded as emptiness of inner. The 'emptiness of inner' refers to the six senses and the six sense consciousnesses (in Buddhism, 'mind' is considered to be one of the senses alongside vision, touch, taste etc.). Verse 181 refers to the eye-sense and the other five senses; verse 182 is the eye-consciousness and the other five sense consciousnesses. I think it's worth just taking a moment to remind ourselves of the relevant explanation in the Abhidharma. (3) Vijñana (consciousness): this is consciousness, which is 'raw awareness' or subjectivity. (4) Nama-rupa ('name and form'): this refers to the psychological and physical aspects of the person. (5) Salayatana (the six sense bases): this includes the sense organs and their objects. (8) Tanha (craving): you get craving and clinging and then the rest of samsara is generated. 7th consciousness = manas-vijñana, which appears in the Heart Sutra translation as the 'dhatu of dharmas'. This refers to deluded awareness, which discriminates and judges. On one hand, it localizes experience through thinking; and on the other hand, it universalizes experience through intuitive perception of alaya-vijñana. 8th consciousness = alaya-vijñana, which is known as the 'mind-consciousness dhatu' or 'storehouse consciousness', and it is the base of the other seven. Indeed, as we saw during the Cittamatra explanation of mind (in verse 6:47), it is the base for all phenomena. The expression ‘The eye is empty of eye’ (and so on for all other phenomena) expresses the nature of emptiness. Emptiness does not mean the absence of something from something else, as when one says that the eye is devoid of an inner agent or of the duality of the subject and object of perception. The eye’s emptiness of itself does not at all invalidate the eye’s appearance. Indeed the Madhyamika teaching asserts that phenomena, despite being empty, do nevertheless appear. The proponents of the other, utterly foolish, theory are passionately attached to words, but not to their meaning. Their idea is something at which the learned merely smile, rejecting it at first glance, as indeed they should. The next two verses are 'emptiness of outer', which refers to form and the outer aggregates, or what just talked about previously as the 'sense objects'. Form is empty of form. Form (rupa): matter, body, material form. Sensation (vedana): sensory experience - pleasant, unpleasant, and neutral. Bear in mind this is not the same as 'feelings' in the sense of emotions. So it's more accurate to use the word 'sensation', but if we use the word 'feeling' to describe the second aggregate, remember that it refers to sensations, not emotions. Perception (samjña): the sensory or mental process that registers, recognizes, and labels (so things like the shape of a tree, the colour green, the emotion of fear: all those are perceptions, labels, imputed phenomena). Mental formations (samskara): these are any mental imprints, or habits, or conditioning that's triggered by an object; any process that makes a person initiate action. It's similar to what we talked about last week when we discussed 'operant conditioning' and behaviourism. It's very similar: the habitual patterns that can be triggered by a stimulus, by an object. Consciousness (vijñana): there are the six types corresponding to the six senses, as we've just seen. And if you follow the Cittamatra, then you have two more for a total of eight types. (4) "no eye dhatu up to no mind dhatu, no dhatu of dharmas, no mind consciousness dhatu" - these are the six (or eight) consciousnesses. So as you can see, these verses are very much connecting us to the Heart Sutra already. The last two lines of verse 184 introduce the 'emptiness of outer and inner', the 3rd of the 16 emptinesses. Is emptiness of outer and inner. In the commentary Rinpoche says it refers to the 18 dhatus of another person, and Mipham has an alternative commentary. He says it refers to the five inner supports of the five sense organs, the kogpa (Wylie: khog pa, Tibetan: ཁོག་པ་). These are the material supports for the senses, which are not to be confused with the senses themselves, and according to the Abhidharma they are included within consciousness, but not included within the senses, so therefore they're both outside and inside. According to the Abhidharma, they're actual physical objects. They have different shapes and are located in the eyes, ears, tongue, and so forth. In Sanskrit they are called the pasada rupas. So for example, the eye sense is supposedly "very small, no bigger in size than the head of a louse". The ear sense is "in the interior of the ear at a spot shaped like a finger ring and fringed by tender tawny hairs". You can find these descriptions of the pasada rupas in the Abhidharma, as well as details of where they supposedly exist in the body. Verses 185-186 introduce the 4th emptiness: the emptiness of emptiness. This was taught to overcome the notion that emptiness truly exists, because some unskilful students might read the Madhyamaka and conclude "Aha! Chandrakirti has established the view of emptiness. That must be my view". But actually it's not like that at all. Is explained as emptiness by the wise. Is regarded as being empty of any essence. Of those holding emptiness as real. 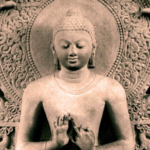 The first point the Buddha made has to do with "right view.'' Wrong view is a matter of conceptualization. Someone is walking toward us - suddenly we freeze. Not only do we freeze ourselves, but we also freeze the space in which the person is walking toward us. We call him "friend" who is walking through this space or "enemy." Thus the person is automatically walking through a frozen situation of fixed ideas - "this is that," or "this is not that." This is what Buddha called "wrong view." It is a conceptualized view that is imperfect because we do not see the situation as it is. There is the possibility, on the other hand, of not freezing that space. The person could walk into a lubricated situation of myself and that person as we are. Such a lubricated situation can exist and can create open space. Of course, openness could be appropriated as a philosophical concept as well, but the philosophy need not necessarily be fixed. The situation could be seen without the idea of lubrication as such, without any fixed idea. In other words, the philosophical attitude could be just to see the situation as it is. "That person walking toward me is not a friend, therefore he is not an enemy either. He is just a: person approaching me. I don't have to pre-judge him at all." That is what is called "right view." Nagarjuna's conclusions are summed up in the principle of "non-dwelling," the main principle of the Madhyamaka school. He said that any philosophical view could be refuted, that one must not dwell upon any answer or description of reality, whether extreme or moderate, including the notion of "one mind." Even to say that non-dwelling is the answer is delusory, for one must not dwell upon non-dwelling. Nagarjuna's way was one of non-philosophy, which was not simply another philosophy at all. He said, "The wise should not dwell in the middle either." I find this to be a very beautiful way of talking about the emptiness of emptiness. And we'll come back to this again when we talk about the Heart Sutra. These two verses are pretty straightforward. Mipham explains the 'emptiness of vastness' was taught in order to counter the Vaibhashika belief in a permanent and truly existing space or infinite immensity. The directions [of space] are vast. Taught to avert fixation on vastness. The 6th kind of emptiness is 'emptiness of the ultimate'. Mipham explains that this refers to Dharmakaya (in the Mahayana) or nirvana (in the Shravakayana). Actually, several commentaries on the 10 Bulls say that the 8th bull that we met earlier today also represents Dharmakaya. So why did Buddha teach this 'emptiness of the ultimate'? To dispel the wrong view of the shravakas that cessation or nirvana is a truly existing phenomenon. Again, we have to be careful, because as soon as our idea of the ultimate becomes a truly existing phenomenon and the ultimate goal of our practice and our path - whether it's enlightenment or the three kayas or anything like that - we fall into the same trap. Rinpoche said many of us only go to Dharma centres and practice in the first place because we think nirvana truly exists. But then we end up clinging to the idea of nirvana. We have big expectations and then endless disappointment and guilt. I think that's lovely practice advice: ask yourself if you're starting to relate to your own practice that way. Have you started to develop some kind of clinging to nirvana or to enlightenment? Is the emptiness of absolute. The 7th emptiness is 'emptiness of compounded'. As we know, the Shravakayana accepts that all compounded (or conditioned) phenomena are impermanent. But here we want to emphasize that they are also emptiness. Because if we don't emphasize that, we may end up with some truly existing substantial base that could be used to develop an idea of truly existing self, just like the point-like atoms that we talked about last week. So to establish the emptiness of phenomena, the Buddha taught that all phenomena, in other words the entirety of the ➜'three worlds' (the desire realm, form realm and formless realm), are all emptiness. The three worlds were certainly explained as compounded. Was taught as emptiness of the compounded. The 8th is 'emptiness of the uncompounded'. Some shravakas believe that nirvana or cessation is uncompounded. And similar to what we said before with the 6th emptiness, Rinpoche said this also applies to things like luminosity, awareness, clear light mind - any time we convert any of these into a phenomenon, we end up developing a subtle clinging. So once again it's good to notice one's own relationship to these supposedly holy, precious, exotic aspects of the path. Are [inherently] non-existent, thus being uncompounded. Is emptiness of the uncompounded. The 9th emptiness is 'emptiness of the limitless' or 'emptiness of what is beyond extremes'. This is taught to counter clinging to the Madhyamaka path itself. Explained as emptiness of the limitless. The 10th is 'emptiness of that which is beginningless and endless', in other words samsara. This is taught to dispel clinging to samsara as truly existing. With neither coming nor going, like a dream. It is known as empty. As explained with certainty in the scriptures [the Mulamadhyamakakarika]. Samsara is said to be without a beginning or end. It is also without duration. In samsara, there is no (real) going (from one life to a later life) and no coming (from an earlier life to the present life)—all is but a dreamlike appearance. The 11th is 'the emptiness of non-discarding'. I prefer the Padmakara translation, 'the emptiness of what should not be rejected'. Here we're referring to the distinctions between virtue and non-virtue on the path. We're trying to eliminate our attachment to virtue. Rinpoche has talked a lot in the last couple of years about 'bad Buddhists', and warning about our tendency to become overly moralistic and holier than thou as Buddhists. If we do that, it becomes a very big obstacle for our path, as we discussed previously in verse 2:3. When we talk here about rejecting the non-virtuous and holding onto the virtuous, we are referring to the Mahayana path itself. To throw out – so it is firmly defined. [Mahayana] is what is never discarded. Called the emptiness of non-discarding. Seeing it as the duality of existence and nonexistence—how exhausting. Clinging to things and their qualities—how depressing. We confess this in the expanse of simplicity, great bliss. Seeing him as clean or unclean—how exhausting. Clinging to the duality of good and bad—how depressing. We confess this in the expanse of Samantabhadra, great bliss. Equanimity is free from being large or small. Seeing it as oneself and others—how exhausting. Clinging to the duality of large and small—how depressing. We confess this in the expanse of equanimity, great bliss. Bodhicitta is free from birth or death. Seeing it as this and future lives—how exhausting. Clinging to the duality of birth and death—how depressing. We confess this in the expanse of unchanging deathlessness. If you know this practice, I really encourage you to consider it as something you might practice for the remaining weeks of this program. The 12th is the 'emptiness of true nature'. Here the point is that the Buddha didn't make up or invent the ultimate essence or nature of phenomena, he just pointed out what was there. Now the challenge is that our opponent might say "Well if it was there already, it's uncontrived, so maybe we should just admit it's truly existing." So we need to combat belief in the truly existing emptiness of emptiness or the potential clinging to the nature of phenomena or the uncontrived nature of the mind. That is why this 12th emptiness is taught. The bodhisattvas or the buddhas. Again, this is very important advice for Vajrayana practitioners who might develop attachment to the nature of mind. Because if you do that, then your path is no better than the Cittamatra path that believes in truly existing mind, or even a Hindu path that believes in truly existing atman. The 13th is the 'emptiness of all phenomena'. Here we're including the 18 dhatus and other phenomena we have talked about already, but they're grouped in a slightly different way here. The 14th is the emptiness of characteristics. It's quite a long section, covering fourteen and a half verses from the last two lines of 201 to 215. Is the emptiness of characteristics. 6:202-6:204 is the emptiness of ground - things like the five aggregates. 6:205-6:209 is the emptiness of path - things like six paramitas, four samadhis, the 37 limbs of enlightenment and so on. All of them are emptiness also. 6:210-6:215 is the emptiness of fruit - for example, the Ten Strengths, the Four Fearlessnesses, and the other qualities of the Buddha such as his great compassion and his omniscient wisdom. All of these are also emptiness. We know this already from Nagarjuna's Mulamadhyamakakarika and from the Vajracchedika Prajñaparamita Sutra (Diamond Sutra), but in these verses we're reaffirming that the ground, everything on the path, all of our practices, bodhicitta, and even up to enlightenment and all the qualities of enlightenment - none of these truly exist. And that's a profound message. Is the specific characteristic of consciousness. The characteristics of the constituents are like a venomous snake. Are the sources of creation. Is the characteristic of the conditioned. Endeavour is the absence of regret. Have been described as such. He taught these as having the characteristic of immutability. Have the characteristic of accomplishing certain [liberation]. Is absence of suffering and ignorance. Such are the characteristics of the instigators of liberation. Was completely established [by the Buddha]. Are in essence extreme stability. Such as memory, have the nature of immeasurability. [Sympathetic] joy has the nature of joy. Equanimity is known as being unpolluted. Having the characteristic of being unmistaken. Is considered to have the characteristic of being direct. Their own characteristic is suchness. The 15th is 'emptiness of the non-apprehended', which Padmakara translates as 'emptiness of the unobservable'. This refers to the three times, which cannot be found or pointed out - the present moment does not remain, the past is gone and the future is not yet born. The fact that they cannot be found is their unobservability, and this unobservability is also emptiness. They are known as non-referential. Not continuous, not dwelling, not perishable. It is the emptiness of that known as the unapprehended. The 16th is 'emptiness of nature without substantial existence', which Padmakara translates as 'emptiness of non-things'. Here we're referring to dependently arisen phenomena. They arise from causes and conditions, so we already know they don't truly exist, but we want to make sure we include them as well so our inventory of phenomena is complete. They also are emptiness. All composite entities are without essence. The emptiness of the insubstantial. The next four verses are a condensed classification. Here the Padmakara translation lists the four categories as: (1) things, (2) non-things, (3) the nature itself. And for the fourth, instead of what we have here as the 'emptiness of other-nature', they say (4) the 'emptiness of the transcendent quality'. Whether or not the buddhas appear, the nature of phenomena is emptiness. That is their transcendent quality. And that transcendent quality is also emptiness. Is described as the five aggregates. Is taught as the emptiness of entities. Is the emptiness of non-entity. Is called the emptiness of nature. Is widely known as transcendent entity. Or the emptiness of transcendent entity. The last two lines of verse 223 are a conclusion and a scriptural source, just to emphasize that all of these twenty are taught in the Prajñaparamita Sutras. These are the widely known [twenty emptinesses]. The longest version of the sutra consists of twelve large books in Tibetan. The 300-line version is called the Trishatika Prajñaparamita Sutra, and is also called the Vajracchedika Prajñaparamita Sutra. So the Vajracchedika Sutra (Diamond Sutra) is actually one of the Prajñaparamita Sutras. The text is largely a quotation from the Pañcavimshatisahasrika Prajñaparamita Sutra (Perfection of Wisdom Sutra in 25000 lines) and it appears to have been composed in Chinese from a translation by Kumarajiva, and then later translated into Sanskrit. The text was probably intended as a dharani rather than a sutra. According to Huili's biography, Xuanzang (玄奘) learned the sutra from an inhabitant of Sichuan, and subsequently chanted it during times of danger on his journey to the West (i.e. India). A dharani is like a long mantra. Dharanis are often chanted to protect oneself from malign influences, from calamities and so on. And I think it's quite apt that it was considered a dharani for chanting, because now the Heart Sutra is very frequently chanted by Buddhists throughout China, Japan, Korea, Vietnam, and in Tibetan Buddhism as well. We'll come back to it in a minute. With verse 223, we have reached the conclusion of the argument, and the last three verses of Chapter 6 are a summary of the qualities obtained by the 6th bhumi bodhisattva. And through conventional truth proceeds to cessation. In verse 224, the bodhisattva on the 6th bhumi realizes the ultimate truth, and sees it as clearly as the kyurura fruit, which in Sanskrit is called the amalaka or amla for short. Some plants produce amalaka that are almost transparent, and if you hold one in your hand, you can see the lines of your hand through the fruit. This is meant to indicate the way that the bodhisattva can completely see 'through' phenomena and see their empty nature. So, although on the ultimate nature there is nothing to enter and no-one who enters, in conventional truth the sixth bhumi bodhisattva enters into cessation. This amalaka fruit has an interesting story. It is a real fruit, from a tree called the emblica myrobalan, Phyllanthus emblica. This tree has quite a history in India and is considered sacred by the Hindus, because the god Vishnu is believed to dwell in it. The tree actually has its own Hindu holy day called Amalaka Ekadashi. Hindus also believe that amla is said to have originated from drops of amrit - the drink that grants the gods immortality - that spilled onto earth accidentally when the gods and demons were fighting after Kshirasagara manthana (the churning of the Ocean of Milk). It is traditionally believed that because the amla originated from drops of amrit, it cures every disease and extends life. The amrit is said to have spilled onto four places, and the Kumbh Mela is celebrated at these four places every 12 years for this reason. People believe that after bathing at these places during the Kumbh Mela you can attain moksha. 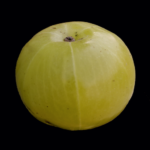 And the amalaka fruit is also auspicious in the Sanskrit Buddhist tradition, as half of one of these amalaka fruits was the final gift given to the Buddhist sangha by the great Indian Emperor Ashoka. And so I think it's quite appropriate that Chandrakirti chose it as the example here, not just because of its transparency, but because it has all these auspicious resonances in the tradition. Verse 225 describes how the 6th bhumi bodhisattvas realize conventional truth. So although their minds rest in cessation, that does not mean they turn away from sentient beings. Indeed, their relative qualities shine forth ever more strongly. And even for ourselves in ordinary life, we know that when we're less caught in our dualism and our own reactivity, we are better able to be there for others. We are more able to make wise and compassionate decisions. He generates compassion for unprotected sentient beings. Will be defeated by his mind. And proceeds to the supreme far shore of the Victorious Ones’ qualities. On broad white wings of relative and ultimate full spread. To gain the far and supreme shore, the oceanic qualities of Victory. With this, we have finished Chapter 6. The Madhyamaka teachings are based on the Prajñaparamita: As we learned in 6:223, the teachings on emptiness and nonduality in the Madhyamakavatara and Chapter 6 in particular are based on the Prajñaparamita Sutras, the shortest version of which is the Heart Sutra. 16 or 20 kinds of emptiness: In particular we saw there are 16 or 20 different kinds of emptiness which list all the ways in which phenomena are empty, including the emptiness of form and all aggregates (verse 6:183) and the emptiness of emptiness itself (6:185-186). The emptiness of emptiness: in the Heart Sutra we not only hear that "form is emptiness", but also that "emptiness is form", which is a beautiful expression of the emptiness of emptiness. And because of this, the Mahayana teaches that it's very important not to put nirvana above samsara, because if we do that then we're introducing some kind of dualism, some kind of preference, which ends up becoming an extreme view that will block our path. The two truths: the final verse of Chapter 6 emphasizes that the Madhyamaka path is based on a correct realization of both of the two truths (the ultimate and conventional): the king of swans flies on his broad wings of the two truths of profound view and vast activities. This Dhamma that I have attained is deep, hard to see, hard to realize, peaceful, refined, beyond the scope of conjecture, subtle, to-be-experienced by the wise [...] What is abstruse, subtle, deep, hard to see, going against the flow — those delighting in passion, cloaked in the mass of darkness, won't see. As I reflected thus, my mind inclined to dwelling at ease, not to teaching the Dhamma. As Rinpoche put it, the Buddha said "I found a truth that is profound, brilliant, deep, vast, infinite - but nobody's going to be able to understand it, so I'll keep quiet in the forest". Now our first instinct might be to hear this as the Buddha implying he didn’t want to teach. And the traditional story supports this interpretation, as then the gods Brahma and Indra came to request and persuade the Buddha to teach, and they gave him a conch and so forth, and then he taught the Four Noble Truths in the Deer Park at Sarnath. But actually, as Rinpoche said, if we consider this statement more carefully, we see that with these words the Buddha has already given his first teaching. When he says, ‘Nobody can hear this teaching, so I won't teach it’, it’s not so much that he doesn’t want to teach. He’s saying that emptiness, the nondual Prajñaparamita that he has realized, is beyond words and so he cannot teach it. It’s not that he doesn’t want to, it’s that he can’t. As Rinpoche says, this is a very beautiful teaching, because right from the beginning, even before the Buddha teaches the Four Noble Truths - traditionally considered his first teaching - he has already indicated that he won’t be able to teach nonduality directly, because it is beyond concepts and beyond words. So this non-teaching is actually a wonderful teaching on nonduality and the emptiness of emptiness. But if the Prajñaparamita is beyond concepts and beyond words, how are we supposed to make sense of it? How are we supposed to integrate it into our lives? This brings us back to the Heart Sutra and to the question that Shariputra asks Avalokiteshvara, "How to practice the profound Prajñaparamita"? This is also our challenge, because we now know intellectually that everything is emptiness, but we don’t know what to do with that knowledge. Initially we might be very excited by the possibility that we can change our narratives, that we can reinterpret and reinvent ourselves as a Bodhisattva or even as a deity, but then it all comes crashing down. If everything is emptiness, how should we act in the world? How can we make any decision about which way to turn? We’ve dissolved all ideas of good and bad, so how do we know what’s good and what’s bad? Maybe we've established a new idea of the self as someone on the Dharma path, we’ve taken refuge, we’ve taken our Bodhisattva vow and maybe we even visualize ourselves as deities, but again why are we doing this? What is the point if it’s all empty? Petty-minded people like us might use these stories to boost our ego because we follow the Mahayana, but this would be a mistake, as the story is actually praising the shravakas! Their shock means that at least they understood something, whereas we are so dumb that it does not touch us. If you're feeling disoriented or upset at hearing these teachings, that may be because you're actually thinking about what they mean for your life, rather than simply engaging with them at an intellectual level. When Rinpoche answers questions, he's always particularly happy when students ask questions that come from a place of contemplation and practice, not just intellect. I'd like to encourage this kind of engagement with the Madhyamaka: where you're seeking to apply it to your work, your relationships, your life. Especially for those of us who live in the world rather than in a monastery, unless we are trying to apply these teachings in our daily life, there's little chance that our habitual thoughts and emotions will change. Our self-image and self-clinging are very strong. Our current Theory-in-Use is very strong. These are no ordinary habits, and we know how much emotion comes when we try to change even ordinary habits. But if we're following the path of the Middle Way with sincerity and commitment, then as we saw earlier when we talked about the Hero’s Journey, at some point we enter 'the dark night of the soul'. We’re lost. Our direction is unclear and our destination is unknown. 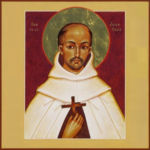 By the way, I know the phrase ‘the dark night of the soul’ might suggest something negative, but actually the original poem by the 16th century Catholic mystic St John of the Cross, La noche oscura del alma, is about the journey of the soul to the mystical union with God. It’s called the 'dark night' because darkness represents that idea that the destination, in this case the soul's union with God, is unknowable. The unknowability of God is expressed in very similar terms in the classic 14th century mystical text, The Cloud of Unknowing. And something very similar is happening now as we embark on the Middle Way and contemplate the 'destination' of nonduality. As soon as we think, it is all confusion. When we become practitioners, we invent a new idea of our 'self', a new life story that is a Dharma story. But our Dharma story is nevertheless just a story. And we've just seen how at the end of Chapter 6, Chandrakirti has refuted the ground, the path, and the fruit. He showed that all of them are just emptiness. None of them truly exist. So we really have to confront the danger of nihilism, and we have to find a way of working with this emptiness, this Prajñaparamita. It’s a big challenge, and many of you are experiencing the emotional impact of engaging seriously with this path - it doesn't just feel like 'the rug has been pulled from under your feet', as the English saying goes, but that the whole ground, the earth that has been beneath your feet since the day you were born, has melted into air. It's not a surprise that you might be feeling disoriented. And that brings us to the Heart Sutra, because Shariputra is asking the same question that all of us are asking, “How should a son or daughter of noble family train who wishes to practice the profound Prajñaparamita?”. He’s facing the same problem. He likewise has dissolved all of his concepts, and now he doesn’t know how to practice. He doesn’t know, because as we’ve just discovered there are no bearings any more. It’s an interesting question because he’s not asking, ‘How should I meditate? How should I dwell in emptiness?’. He’s asking, ‘How should I practice this in my life?’ As Rinpoche said, ‘How should I live by and act according to the Prajñaparamita?’ Shariputra is not just looking at meditation, he’s looking both at meditation and post-meditation. Rinpoche talked a lot during the Kathmandu teaching about how one of the challenges with this question is that there is no answer in Buddhism about how one should act and the kind of lifestyle one should follow as a Buddhist. 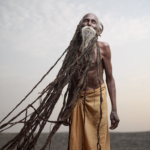 We have everything from monks that shave their head and take that extremely seriously, to sadhus who grow their hair long and take that extremely seriously. And they’re both Buddhists and we cannot say one is right and one is wrong. We don’t have clear guidance on how our action should look. The only way to know the right path is through the view. I think another problem many of us face is that our meditation and post-meditation have become very separated. We may do one thing when we're on our cushion, but when it comes to actually bringing emptiness into our lives - we don’t know what to do. It’s a little bit like the bodhisattvas on the bhumis: during their meditation time, we can’t distinguish them, but during their post meditation time, they’re very different. And what they’re actually doing on the bhumis is successively finding a way to make their post-meditation more like their meditation. Until finally when they attain the stage of the Buddha there is no separation, no distinction anymore between meditation and post-meditation. So what can we do if we are facing this kind of question? Some of you have asked me to say something about my own journey through these teachings. For years I was stuck in this same place. 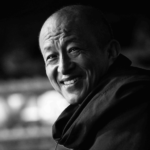 I would ask Rinpoche, "If everything is emptiness, how should we decide what to do in the world? If everything is emptiness, how can we even practice compassion? Because we cannot say that one path of action is truly any better than any other path". I could see no way to choose a preferred way of living, a preferred thing to do with life. I think perhaps I wanted some kind of ultimate purpose, some validation that I was doing something worthy or good, perhaps that I was being a good bodhisattva or something. I'm not really sure I can say any more. If you look at bookstores, magazines and websites nowadays, they are overflowing with advice on happiness, self-help, and positive psychology. And so much of it is about discovering and then following our passion, our life purpose, as if it is somehow lying buried under the ground for us to discover. It's a very eternalistic perspective, founded on a deep insecurity. And of course as followers of the Middle Way, we are hardly going to fall for simplistic answers and narratives that supposedly "resolve" the existential questions of life. These kinds of answers might bring some temporary comfort to beings roaming endlessly in samsara, but we know that all ideas of self are baseless - and all narratives we might choose to tell about our passion and purpose are equally empty. With that in mind, I’d like to take a moment to do some practice. We’re going to do a brief meditation, very similar to what Rinpoche taught in Kathmandu. If you happen to be listening to the audio while you are driving, please be careful. Wherever you are, watching or listening to this, take a moment to get a sense of your environment. Now find something in front of you to look at. Whatever. Just be aware of that. Actually, if you can, be aware that you’re doing that. Okay, did you do it? As Rinpoche said, this has nothing to do with sitting straight. He said it’s so disheartening when people think that's what practice is about. He said 'It’s a poverty mentality. Do what you want. Scratch, yawn, cough, get confused if you want'. The only thing that matters is, did you know what you were doing as you were doing it? If you did, you should trust it. Yes, it’s only a short moment, but you have actually done it. You were aware of what was happening right now in the present moment. It wasn’t some later memory, like some of the Shravakayana mindfulness practices. Here we're saying meditation is just knowing what is happening. And if you did that, you should consider it was a good meditation. Don’t worry about having to do it 24 hours at a time. And why is meditation important? Because in that moment you were not distracted. Okay, we'll come back to this later. Addressed in this way, noble Avalokiteshvara, the bodhisattva mahasattva said to venerable Shariputra, "O, Shariputra, a son or daughter of noble family who wishes to practice the profound prajñaparamita should see in this way: seeing the five skandhas to be empty of nature. Form is emptiness; emptiness also is form. Emptiness is no other than form; form is no other than emptiness. In the same way, feeling, perception, formation, and consciousness are emptiness. Thus, Shariputra, all dharmas are emptiness. He chose to speak first of the five aggregates, not about mathematics or political science or ethics or philosophy. He talked about the five aggregates because, as we saw in Week 5, that is the base that we incorrectly take as the idea for self, and then there's self-cherishing, self-clinging and the rest. So if we can start by understanding the emptiness of the five aggregates, just as we did in the previous weeks, then we can refute the self. As Rinpoche said, from just these two lines, "Form is emptiness, emptiness is form", two very different traditions of Buddhism emerged. From "Form is emptiness" we get Nagarjuna and his followers, the whole 'Second Turning' tradition of Madhyamaka and the emptiness teachings. And from "Emptiness is form", we get Asanga and the whole 'Third Turning' tradition of the Buddha-nature teachings, which has been particularly influential in China, Japan and throughout East Asia. And as you know, these two are very complementary. They're really just focusing on different aspects of the same thing. When Rinpoche taught the Uttaratantra teachings on Buddha-nature, he said that if Madhyamaka is more about the 'form is emptiness' aspect of nonduality, then the Uttaratantra is more a study of the ‘emptiness is form’ aspect. I've noticed that although most of us are familiar with the words "Form is emptiness, emptiness is form", many of us miss something quite important here. Namely, that we get caught up in the word "form", and we focus exclusively on the form aggregate. Whereas actually, as we just heard, the same applies to all of the aggregates. We could equally say, "Feeling is emptiness, emptiness is feeling" or "Consciousness is emptiness, emptiness is consciousness". But I notice that actually if we look at the debates that are happening online on the Forum right now, we’re not talking about these other aggregates. This is a big habit we need to fix. Another habit is that we end up talking about 'form' as an object, rather than as a subject. We’ll talk about this in a second, but the very same is true in Western mindfulness, where Western mindfulness teachers tend to focus almost exclusively on the first two of the five aggregates - the form and sensation aggregates. And although the teachings on the "Four Foundations of Mindfulness" in the Satipatthana Sutta say that we should also be mindful of the other aggregates, most of the time that is not taught in the West. In particular, what about the consciousness aggregate, the fifth aggregates? We say ‘Form is emptiness’, but what about ‘consciousness is emptiness, emptiness is consciousness’? Then we can talk about the pairing of emptiness and Buddha nature, emptiness and clarity, emptiness and luminosity, emptiness and spontaneous presence. Once you start understanding these aspects, you’ll quickly see that the Heart Sutra doesn’t only refer to objects like trees. It also refers to things that we normally refer to as subject, like consciousness. So when you say "Form is emptiness, emptiness is form", I'd encourage you to also say, "Consciousness is emptiness, emptiness is consciousness". Of course since this is a Madhyamika teaching, you should be thinking of subject and object as nondual. We’ll come back to this in a minute. The point I'd like to emphasize here is that in our study of Madhyamaka we’re using the nondual language of emptiness, and it’s supposed to be taking us to a place of nonduality, but a lot of the time we’re just using it very dualistically. We talk about the emptiness of tree. We are comfortable with the idea that the tree doesn't truly exist, and we say 'tree is emptiness'. But we're talking just about the object. It's still very dualistic. What about the nonduality of subject and object? What about the Heart Sutra's teaching that emptiness is also consciousness? How can we extend our understanding of emptiness to ensure these are included? Similarly as we have seen, the mainstream of Western mindfulness comes from the Burmese tradition, and it is very dualistic. We cultivate mindfulness of the body, of the breath, of walking, of sensation. We learn to become mindful and unattached to these objects, but there is no focus on the subject. It’s all part of the ‘form is emptiness’, and we don’t have the ‘emptiness is form’ aspects of clarity and luminosity. And a really important part of that is the we don't inquire into the fundamental dualism of the subject-object split, the debate on 1st-person/3rd-person perspectives that is creating confusion among cognitive scientists and contemporary philosophers of mind, as we saw in Week 5. I'd like to relate this back to the idea of how to practice. Many years ago I asked Rinpoche: 'If everything is equally empty then why do we need to use the Buddha as the basis of our practice. Why can’t we pray to a tree? Surely a tree is just as good if everything is emptiness?' And Rinpoche said, 'Yes of course ultimately there is no difference, they’re all equally good in the ultimate'. But the difference is conventionally there is much more of a tradition, support, much more merit around following the Dharma in the way it’s currently taught. There are teachers and teachings, there are monasteries and sangha, there are stupas and all kinds of things to inspire you. If you’re going to start your own Dharma tradition based on worshipping trees, you could do it, but you’d have to rebuild that entire infrastructure. You wouldn't have all the conventional parts of the path. It’s worth reflecting that someone who really understands the view can see anything as a Dharma teaching. Anything can inspire them, and I don't mean in the Western sense of 'inspired', like sometimes people say they can be inspired by a beautiful tree or a vast landscape or a beautiful sunset, or amazing art or music. Yes, those things may touch us emotionally, but that doesn’t mean there is any nonduality there, it doesn’t mean that they are inspiring us to see the Dharma, to see the truth. In Week 3 we talked about the story of how Patrul Rinpoche introduced the nature of mind to Nyoshul Lungtok outside Dzogchen Monastery. He said the very famous lines, ‘Do you see the stars up in the sky?'. And Nyoshul Lungtok got it in that moment, he was introduced to the nature of mind. And yet, as Rinpoche says, how many young lovers have said those same words to each other, ‘Do you see the stars, my love?’ And then those same lines only become a source of more attachment and delusion. Once again, this is where we need merit. What is the distinction between Nyoshul Lungtok being able to understand ‘Do you see the stars’ and accomplish realization, and a young couple hearing the same words - whereas for them it just leads them to more attachment and delusion? This also relates to Rinpoche’s example of the three kinds of listener that we talked about in previous weeks. How is it that some of us can hear and understand a teaching the first time, while for others of us it takes a long time and a lot of repetition, and a third kind of person will never hear it until something happens to us and we have a change in our life circumstances? Irrational is the fool believing in fairy tales, believing unquestioningly in what our culture, our academia, our politicians tell us. Rational is what we're doing in our study of the Madhyamaka. We establish the basis of the causal path with logic and reasoning, we realize from our study of Madhyamaka that all these stories and ideas of self are without base. So we develop the confidence that we can rewrite them, and we can redefine ourselves as a Buddhist, as a bodhisattva, a deity. The last example is a little trickier, as we haven't yet established a deep understanding of Buddhanature in these teachings - for that we also need to study the Uttaratantra. Beyond-rational: For the student of superior faculties, someone who is truly open minded, they can have the truth pointed out to them directly. They can accommodate a new story with great ease, without any struggle or resistance. Many of you were saying this week that changing our idea of self is such a struggle. You told me, 'yes, sure in principle I know I can change my story, but in practice it's hard, there is so much habit'. And yes that's true. As we said last week, it is all habit. And so it all comes down to this idea of merit, this idea of being a disciple of superior faculties. It's all a question of have you accumulated the necessary merit? I know it's frustrating, and some of us wish we could understand this more quickly, but as we've said before there is only one answer. You need more merit so you have to practice. That's all there is to do. 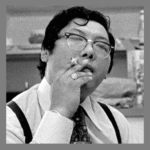 If we are able to see the non-existence of form, as Mipham said that's a non affirming negation. That's the shravaka way. It's just refuting one extreme, the first extreme of existence. Whereas in the Madhyamaka, we refute all four extremes: existence, non-existence, both and neither. So back to Patrul Rinpoche and Nyoshul Lungtok in the nighttime outside Dzogchen Monastery. Patrul Rinpoche wasn't asking Nyoshul Lungtok to look at the stars and see them as empty. I mean we could understand it that way, and yes of course it's better to see the stars as empty than not, we could say 'oh yeah, they are not truly existing stars, they're just conventional phenomena'. But that's still a very basic dualistic way of thinking. That kind of emptiness does not bring us nondual awareness. For most of us it's like a dry, intellectual, academic chanting of the Heart Sutra. We just kind of drone 'Form is emptiness, emptiness is form'. But we haven't realized anything. It hasn't touched us. A scientist can tell you the stars are empty, but he knows nothing about non-duality. So what's the difference? Well, it's like what Rinpoche was saying when he invited us to know what was happening while it was happening in the meditation. When Patrul Rinpoche asked Nyoshul Lungtok, 'Can you see the stars? ', he wasn't just asking him if he was able to see the emptiness of the object. He was asking him if in that moment he knew that he was seeing the stars. Did he know that he was seeing the stars at the same time as he was seeing them? Because that simultaneous awareness of the subject and the object - now that is non-duality. And I should emphasize that it's not about bringing another 'watcher' to have yet another dualistic relationship between 'watcher' and 'watched'. Even the word 'see' is probably not the right word because you can't see yourself and see the stars, at the same time. Seeing is dualistic. There's subject and object. But as we know from Jigme Lingpa, our words and our concepts collapse, as anyone who has experienced this will know. So as Rinpoche explained, this is what is meant by mindfulness and awareness. Whatever you are paying attention to, whatever it is that you're looking at - yes, be aware of the object, but at the same time, also know that you are seeing the object. Or if you're engaging in an action, be mindful and aware of your action, but at the same time also know that you are doing it. Find an object in front of you, just be aware of the object, and once again if you can know that you're looking at it while you're looking at it. Okay, did you know that you were looking at it? Duality is seeing the object, all our concepts, our words, talking about the object being empty, like "tree is empty, empty is tree". There's no reference to the subject, we're still totally trapped in dualism. Nonduality is when we are aware of the object and the subject both together, simultaneously. If you experienced it just now, you'll know what I mean. Duality: we see our idea of self purely as an object, as a phenomenon. Yes, we understand how our self-narrative has become stuck in stories of family, culture, tribe, gender, identity, whatever they may be. And if we understand that these stories are baseless and empty, then we can write a new story, a Dharma story, for example "I'm a practitioner following the way of the Buddha", "I'm a bodhisattva" or "I'm a deity." But all this is still telling a story about our "self" as an object. It's still very dualistic. We've changed our story, but within a dualistic frame. The storyteller has not yet been brought into the picture. So what about the possibility of non-dual storytelling? Nonduality: this is when you know that you're telling the story as you tell the story. Can you see the object that you're creating - the self-narrative - at the same time that you know the subject is there? If you can do this, you'll find that both the story and the subject become completely empty and fluid and dissolve. In the teachings it's sometimes said to be like a snake uncoiling itself. This is non-dual practice. You reveal or uncover something beyond words and concepts. We can call it "nondual awareness" or "emptiness and clarity in union" or "Buddha-nature", but as we know by now, words cannot do it justice. No ignorance, no end of ignorance up to no old age and death, no end of old age and death; no suffering, no origin of suffering, no cessation of suffering, no path, no wisdom, no attainment, and no non-attainment. Therefore, Shariputra, since the bodhisattvas have no attainment, they abide by means of prajñaparamita. Since there is no obscuration of mind, there is no fear. They transcend falsity and attain complete nirvana. All the buddhas of the three times, by means of prajñaparamita, fully awaken to unsurpassable, true, complete enlightenment. I suppose I should ask you, did you know that you were listening just now? If so, very good. There are two stages to understanding egolessness. In the first stage we perceive that ego does not exist as a solid entity, that it is impermanent, constantly changing, that it was our concepts that made it seem solid. So we conclude that ego does not exist. But we still have formulated a subtle concept of egolessness. There is still a watcher of the egolessness, a watcher to identify with it and maintain his existence. The second stage is seeing through this subtle concept and dropping the watcher. So true egolessness is the absence of the concept of egolessness. In the first stage there is a sense of someone perceiving egolessness. In the second, even the perceiver does not exist. In the first, we perceive that there is no fixed entity because everything is relative to something else. In the second stage there is the understanding that the notion of relativity needs a watcher to perceive it, to confirm it, which introduces another relative notion, the watcher and the watched. A true understanding of egolessness cuts through opinion. The absence of a notion of egolessness allows us to fully experience pain, birth and death because then there are no philosophical paddings. The whole idea is that we must drop all reference points, all concepts of what is or what should be. Then it is possible to experience the uniqueness and vividness of phenomena directly. There is tremendous room to experience things, to allow experience to occur and pass away. Movement happens within vast space. Whatever happens, pleasure and pain, birth and death and so forth, are not interfered with but are experienced in their fullest flavour. Whether they are sweet or sour, they are experienced completely, without philosophical overlays or emotional attitudes to make things seem lovable or presentable. We are never trapped in life, because there are constant opportunities for creativity, challenges for improvisation. Ironically, by seeing clearly and acknowledging our egolessness, we may discover that suffering contains bliss, impermanence contains continuity or eternity and egolessness contains the earth quality of solid being. But this transcendental bliss, continuity and beingness is not based on fantasies, ideas or fears. And so with that, we bring week six to a close. Thank you once again. I wish you a wonderful week of practice and strongly encourage you to try and practice in the way that Rinpoche suggested, and I look forward to seeing you next week. Good evening.